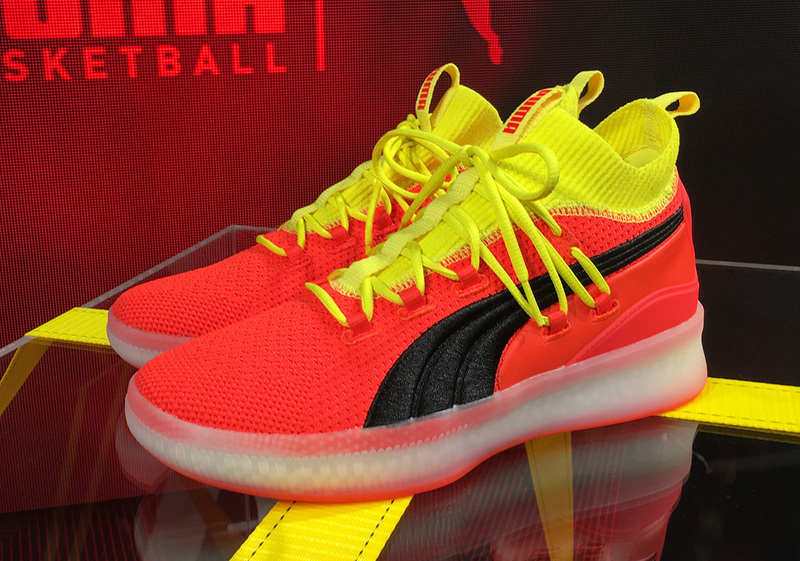 Puma Basketball is officially back. After generating a substantial amount of buzz by announcing they’d be relaunching the long-dormant line and signing promising rookies DeAndre Ayton, Marvin Bagley III (who received the biggest rookie sneaker deal since Kevin Durant), Michael Porter Jr, and Zhaire Smith to multi-year endorsement deals the German brand has unveiled their first new silhouette that aims to fuse street-ready style with advanced performance technology: the Clyde Court Disrupt. Drawing design inspiration from the classic Puma Clyde, the new performance silhouette features an engineered knit upper that offers support and flexibility, with a plastic heel counter serving as a stability aid. 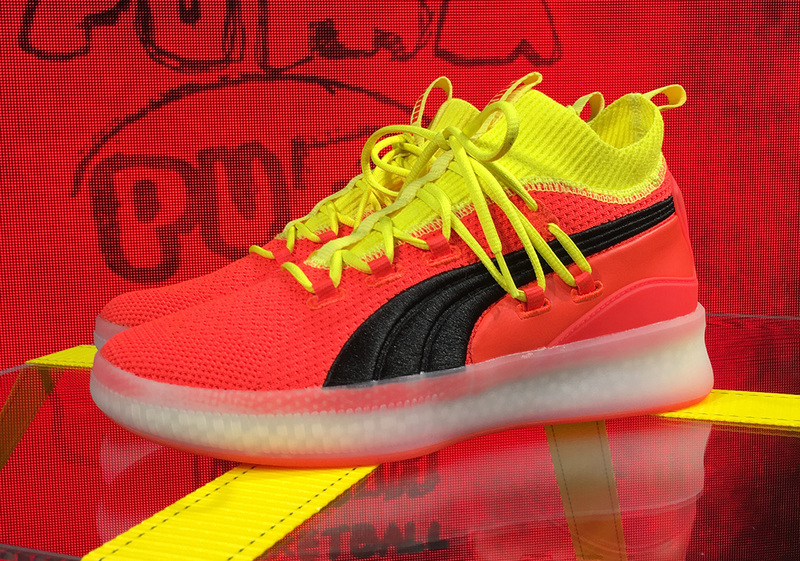 A rubber cupsole offers excellent lockdown and traction, and a hybrid foam technology housed in the midsole offers further cushioning and support. From an aesthetic standpoint, the shoe boasts a head-turning look due to its loud reddish orange/yellow upper and unique lacing system that drops down to the low midfoot. Puma’s iconic formstripe arrives in an embroidered black, and “1973” hits adorn the heels, nodding to the year the classic Clyde was first released. The shoe’s look is completed with a semi-translucent outsole that features a red tint. 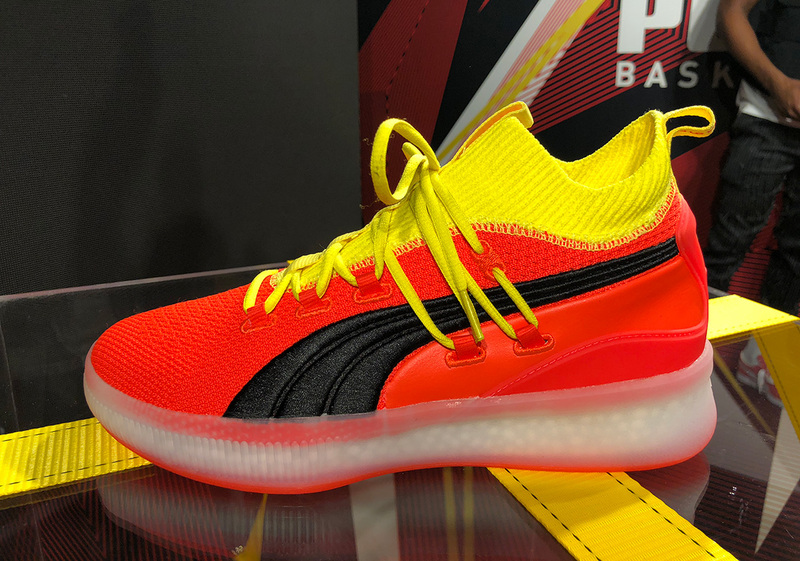 Enjoy a first look at the new Puma hoop shoe below, and expect them to release October 1st, just in time for the start of the 2018-19 NBA season.